Yesterday it rained for hours. When I stepped out onto the deck during a brief halt in the downpour, there was the heady perfume of roses in full bloom, kissed by raindrops and dishing out frothy sublime fragrance with abandon. Moving toward the door in wellies, with a camera around my neck and a mug of Constant Comment in hand, I was turning over words in my mind: serendipity, summer, lunar, zephyr, solstice... thinking that one of the words I was murmuring like a litany would be the Friday word of the week, something I could enjoy researching, musing on and writing about here today. Finding a good word and following it all the way back to its Indo-European roots is a lark, and it is always such fun to do. No wait..... We wrote about zephyrs last week, and we wrote about solstices early this week on the day of Litha or the Summer Solstice. Fragrance is the word for this day, and it is the only word that will do.The word hails from the early fifteenth century at least, springing from late Middle English, thence from the Latin frāgrāns, frāgrāre meaning "to give off an odor" or simply "to smell sweet". Roget's Thesaurus gives us synonyms such as: aroma, redolence, perfume, elixir, bouquet, incense, musk, attar, balm, civet, potpourri, nosegay, scent, sachet, cologne. Rain or no rain, my June garden is an abode of fragrance and sweetness, and it's enough to fill an ancient rose loving Celt, Roman, Persian or Egyptian with wonder, admiration and flat-out envy. Finding an adjective for such wild and earthy opulence is always difficult, and for a few minutes yesterday, I was completely lost for words. The gloriously blushed rose here this morning is David Austin's exquisite "Heritage", and the master himself describes its perfume as classically beautiful with overtones of fruit, honey and carnation on a myrrh background. Next up are the antique Maiden's Blush, David Austin's Abraham Darby, Evelyn, Gertrude Jekyll and the gorgeous once-blooming Constance Spry. Hallelujah, summer is here, and it really doesn't matter that it is raining again this morning. 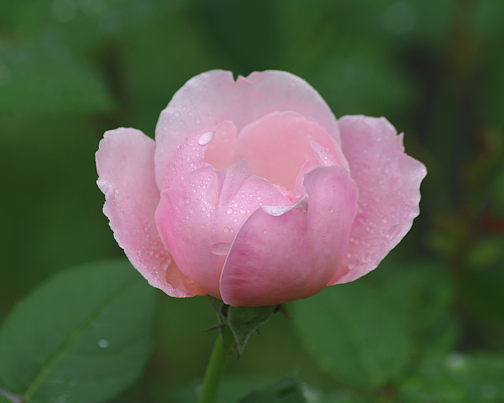 The pink Heritage rose is beauty, diamond dew, and sweet bliss scent. To smell sweet is a good thing. It's no wonder that fragrance was once thought to signify paradise!